It's not our fault. 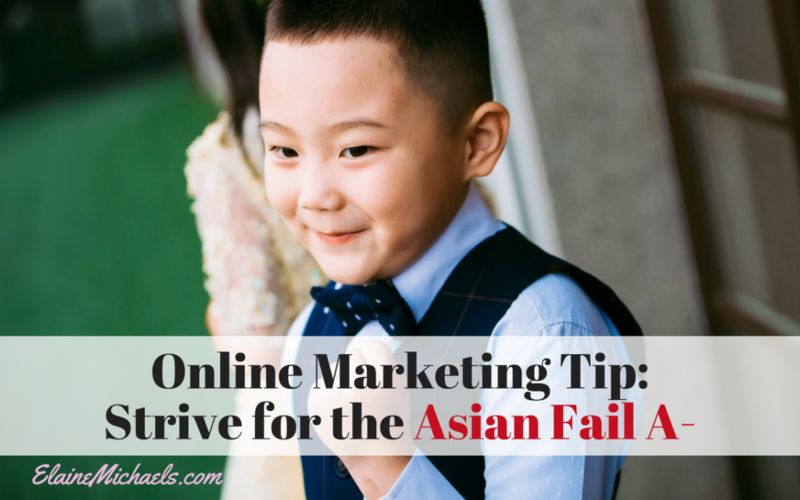 You were conditioned to shoot for A+… Now in Online Marketing, it's best to give the Asian Fail (A-). Asia. They grew up in a highly competitive, cutthroat academic environment. 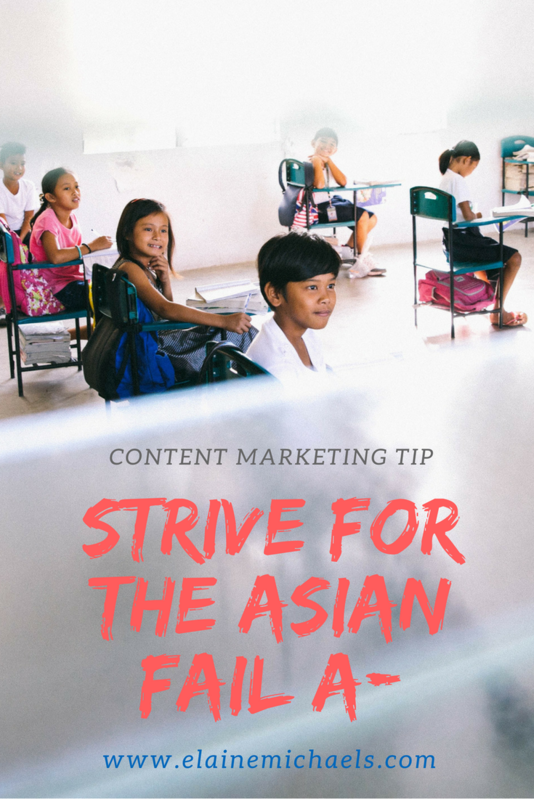 Recently, I started to hear that there was this term being thrown around, called the Asian Fail. It's basically anything less than an A+. A grade of A-, though it's a pretty good grade, it would be considered an Asian Fail. Unless you're the elite like Elon Musk, who did not bother even showing up to class at Stanford University because he knew that all he needed to do was read the textbook and show up for the final to ace the class. But very few of us can obtain let alone maintain that high standard. Instead, what is important in online marketing or content marketing, is to get your content out there even if there are typos or errors. If striving for the A++ in everything that you do and this is the reason that is actually holding you back, you're missing out from receiving what you can potentially earn!! I know for some of you this is tough, perhaps getting an A- was even considered an Asian Fail. In entrepreneurship, the rules are different. Showing up is more important than presenting yourself like a perfectly wrapped gift with a perfectly tied pink bow. Even if you show up messy, with no make up, with a mom bun, and glasses… consistency outweighs perfection. Take a look at Steve Jobs, the founder of the greatest empire called Apple, only wore black turtlenecks and jeans. If you've watched the movie Jobs, you'll see he failed so badly that they kicked out of Apple, the very company that he started?! Talk about failing, falling, and then moving forward. He came back and built one of the biggest companies out there. Look at Mark Zuckerberg, only wears the same thing every single day. Everything is intentional. It's because he understands time is fleeting and one less decision to make allows more time to serve his community. Use your time effectively. You can only leverage your content online if it's out there. Are you saying to put out Less-Than-Stellar Content? What I'm saying is this. If you are waiting for something to be less than perfect before you release it to the public, and THAT is the thing holding you back… You need to be satisfied with what you have and consistently put out that stuff, if it's valuable! If you keep waiting, not putting out ANYTHING and you realize 1 month passes, then a second… then all of a sudden you realize it's been 1 year…, then the perfectionist in you, looking for that A piece is a detriment to your business and your life! In this instant, you should put out the A- content and if you're able to put out something everyday for 1 year… Guess what? You have 365 pieces of content to share across the board and that many opportunities to connect with your audience. That could mean the difference between a successful business vs. being still BROKE. C. Crossed my T's by reading through it and doing some SEO magic on it. Is it the best piece of work that I have created in my lifetime? No. Did I get my point across? Yep. So go out there and be a A- student. Asian Fail Forward!! I give you permission! Still struggling with your marketing for your business? Seriously let me take the pressure off of you. Hop into my 10 days to Lead Generation Mastery. I aim to please and you won't be sorry! Just be ready for some brain infusion.